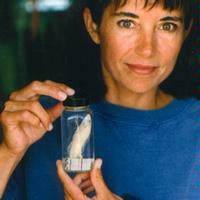 Baldwin is a curator at the Smithsonian’s National Museum of Natural History, where she has daily access to the world’s largest fish collection. Its 4 million specimens are a treasure trove for her study of the diversity, evolution, and larval development of tropical and deep-sea fishes. She also has access to museum’s 6 million annual visitors. She devotes considerable time to public outreach, including stints as the featured scientist in the Smithsonian’s 3-D IMAX film Galápagos, and as one of three scientists charged with developing content for the museum’s new Ocean Hall.